‘DEMOCRACY 2.0″ is a scintillating story ready to blast your mind with its masterly plot that is every bit enthralling, relevant and contemporary. It’s a story that tells you all about change; it tells you how to go about changing situations in difficult, or maybe imposible, circumstances. Guess what happens when an IAS topper, a Harvard drop-out and a top-notch mediawoman come together and join hands under captivating circumstances to take on the ills of existing socio-political system through a unique Post-Gandhian movement conceived by them? Well, revolution! Here, two young men and a young woman, coming from entirely different socio-economic backgrounds and passing through different childhood experiences, traverse the courses of their independent lives till they happen to meet one another and discover that all the three carry the same dreams within them – the dream to change India and make India it real democracy. Aditya, an IAS topper and Siddhanta, a management student from Harvard, walk out of the promises of their respective luxurious lives and come to a non-descript village near a small town, Ara, where they set up ‘The Ara Club’, the secret meeting place that attracts some of the best young professionals of India who nurture similar ambitions of bringing a systemic change in India. Devanjali, the editor-in-chief of ‘The Mirror News’, the biggest television news channels of India, is a woman who carries within herself the dream to purge the media industry of its existing ills. By curious designs, she finds herself drawn into the secrets of The Ara Club and becomes one of its natural members. Together, they work out a formidable, new-age movement, which they prefer to call the ‘Post-Gandhian Movement’, that happens to be full with stunning ideas of change. Soon, it catches the fancy of the urban middle class and the rural India alike and snowballs into a pan-Indian revolution that demolishes not only the corrupt and insensible government of the day but also goes to sweep away few fixed stereotypes of Indian politics and society, esp those associated with democracy, caste-system and the cynical urban middle-class. Finally, the movement brings about a movement that results in establishing the next version of Democracy, called “Democracy 2.0” that meets the aspiration of the modern India. But, will the democrats of the Ara club succeed in ushering in a systemic change or will the forces of the status-quo, led by a powerful ruling family and its protégé Prime-Minister, destroy them? On top of it, what happens to the subtle, intense and ethereal saga of love between Aditya and Devanjali that remains unsaid for long? It’s a love that sets the background of one of the biggest revolution, India is set to witness; it’s a love that creates one of the biggest leaders India is going to have ever. 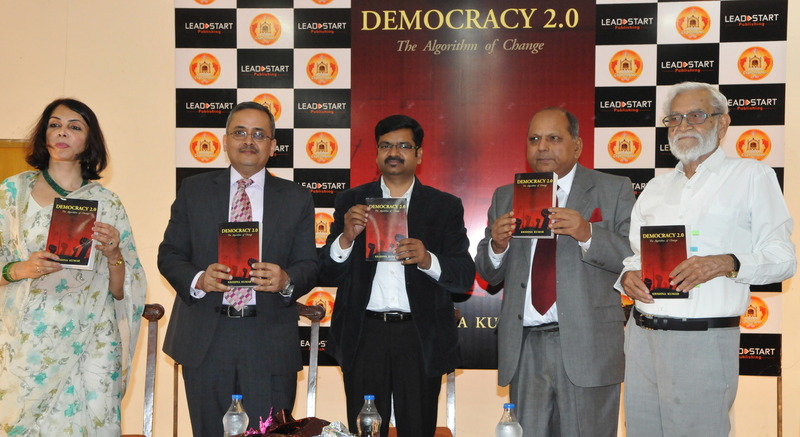 ‘DEMOCRACY 2.0’ is a novel that promises to re-open many established postulates of Indian polity and democracy in a simulated political environment of contemporary India and is slated to introduce few ground-breaking concepts, such as ‘Social Tourism’ and ‘Post-Gandhism’ in the socio-political discourses of modern India. Come to the realm of Democracy 2.0 and take pride in beoming the wonderful ambassadors of that change! The book is published from Leadstart Publishing, Mumbai in 2014.